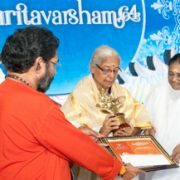 In conjunction with the 64th birthday celebrations, the 2017 Amrita Keerti Puraskar was bestowed upon Dr. M. Lakshmi Kumari for her noteworthy contributions to education about Sanatana Dharma. 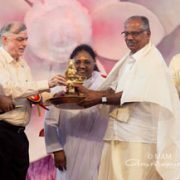 She was presented the AmritaKeerti Puraskar by Jual Oram, Union Minister for Tribal Affairs in Amma’s presence. 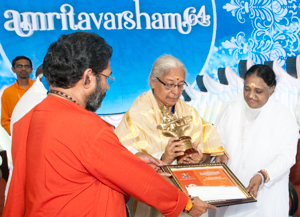 Dr. M. Lakshmi Kumari has dedicated her entire life to service of society after finishing her higher studies. 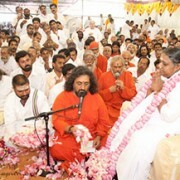 She is currently serving as Chairman of Vivekananda Kendra Vedic Vision Foundation. 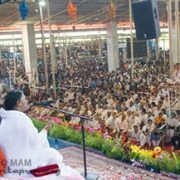 Dr. Lakshmi Kumari has undertaken the task of spreading Swami Vivekananda’s messages and philosophical thought, the strength of ancient India’s perspectives that ensued from direct experience, and the extent of its triumph in the world. 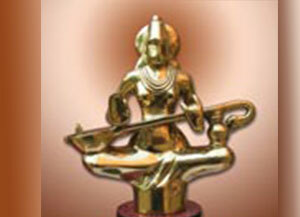 As such, her work has been successful in raising the stature of Swami Vivekananda among contemporaries and youth. 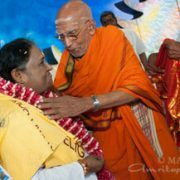 Dr. Lakshmi Kumari has served as President of Vivekananda Kendra, Kanyakumari. 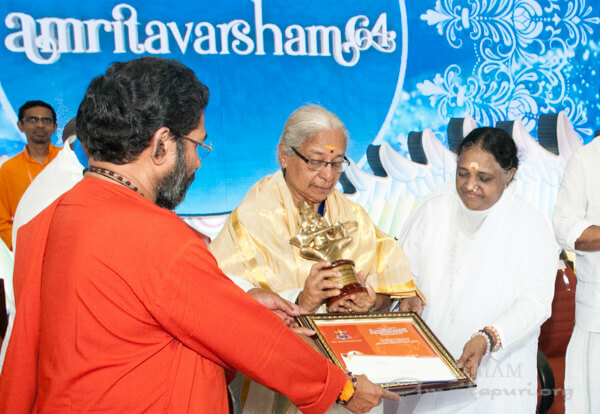 Motivated by Sister Nivedita’s women’s welfare principles, Dr. Lakshmi Kumari has devoted herself to the uplift of Indian culture and the ancient spiritual tradition of India.